eSpline offers an Automated VC and IPC Testing solution designed for you to easily enter test cases once and use mutliple times. How about performing a regression test on your entire VC/IPC model? Not possible without this type of software tool. Improve the quality of your of your model by thoroughly testing your model and avoid the mistakes in production. Ask for a demonstation and see for yourself. 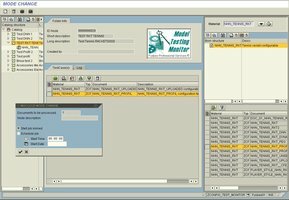 eSpline offers a software suite of applications named Avenue Portal where it enables some additional control of VC model change process, by tracking your model changes with an easy to use a comparison tool, documenting your model, and improving model quality with an automated testing interface. Extract your VC or IPC models to your portal, compare different versions of the same model, get a VC Health Check, integrate with your PMEVC, document your changes with comments, track your tasks on all models, then move the model to another SAP client.